Fees, late payments and delayed retirement savings may seem like no big deal now, but they're expensive in the long run. Whether it’s a pebble in your boot on a long hike or a small fee in a retirement savings account, little things that go unnoticed or ignored can lead to an outsized amount of pain. One-time fees — a $3 out-of-network ATM charge or a $15 service charge for an online ticket purchase — aren’t budget busters. But ongoing fees can be lethal, especially in retirement investment accounts like IRAs and 401(k)s where fees have decades to accrue. Consider a 1% management fee charged on a retirement savings account. Because the fee is based on the value of the assets in the account, as the portfolio value rises, so does the fee. And, boy, does it compound over time. Say you have $100,000 in that account and it averages 6% annual returns. After 40 years you’d have $688,085. Great — but you’d have $930,574 if you’d paid only 0.25% in fees. Payment history has a big influence on your credit score. Delinquent payments — 30 days or more past due, or any accounts sent to collections — can cost you much more than a late fee. Over the life of the 30-year, fixed-rate mortgage, the person whose credit score is lower would pay $41,000 more in interest. If you have a 401(k) or other workplace retirement plan, this is your first stop. If your employer matches a portion of your contribution, invest at least enough to get this free money. No workplace plan? Open your own tax-favored retirement savings account (aka an IRA). Automation has brought down all the costs of investing, thanks in particular to the rise of robo-advisors. These automated online services help you pick and manage low-fee investments for an affordable fee. Want a personal touch? Many robo-advisors offer access to humans when you have questions. Or you could hire a fee-only advisor. Here’s how to choose the best type of financial advisor for you. Many brokerage houses and robo-advisors have no minimum opening balance. Open an account now and add to it whenever you can spare some cash. It becomes harder to catch up with each passing year. That’s because compound interest — when earnings on investments grow your balance and generate even more earnings — takes time. If you start at the beginning of your career, saving $415 a month gives you $1 million at 67. 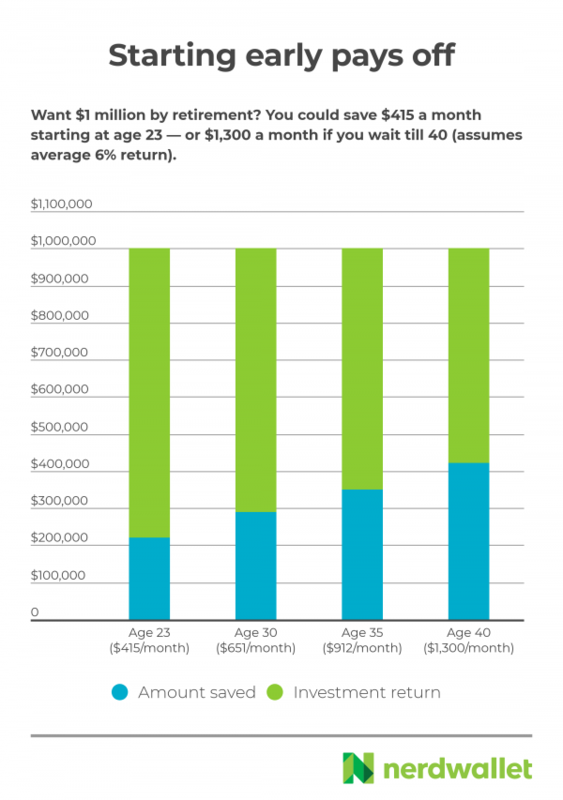 Delay until you’re 40 and you’d need to tuck away $1,300 a month to reach that number. Public policy group Demos ran the math for a median-income couple, both of whom work. 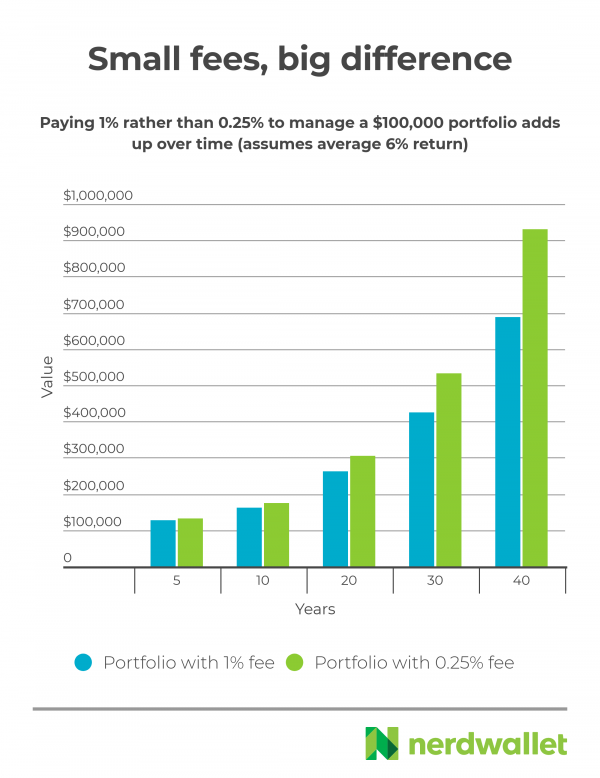 Based on average contribution rates, 401(k) fees and plan costs, over 40 years they’d pay nearly $155,000 in investment fees, giving up almost one-third of their total retirement savings returns. While you may not be required to take your retirement savings with you when you leave, you probably should. Moving your 401(k) money into an IRA (see the IRA “rollover” process outlined here) eliminates those administrative fees. It also opens up the universe of investment options, letting you shop around for funds with the lowest management fees. Plus you can retain the same tax benefits the workplace retirement plan offered.